"Experiencing great things with BrightIdea"
I like the entire concept of idea crowdsourcing. The BrightIdea platform is easy to use, and the support is top-notch. There's not much to dislike. In the past I have recommended consolidating menu/set-up items, because for a time it was confusing where each item was; i.e., rules in pipeline set up, and varying communications/emails split between pipeline menu, webstorm setup, and enterprise setup. I believe the development team is making things easier. I highly recommend BrightIdea. They've been a fantastic vendor, and we look forward to using their product for a very long time. In our large organization groups/offices were sometimes conducting similar initiatives and process improvements within their own silos. BrightIdea's platform allows us to give exposure to the initiatives, and bring all stakeholders together, so they can collectively tackle challenges and be aligned. Ease of use, highly customizable to match our brand, constant enhancements being made by Brightidea and communicated, integration with Active Directory so I am not provisioning/deprovisioning users, robust knowledge base, and nice UI. They are also there every step of the way during implementation and after as you continue to use the product. Better real-world examples on how to get more use out of all of the applications available. Pricing could be a little better too! Great value if you take the time to implement it correctly. They provide a responsive, knowledgeable team to assist you with setup and they are always willing to help. I have been impressed with the changes that have been made since we have been using the product, they are constantly improving the software and actively listen to feedback. Using Brightidea, we are able to crowdsource solutions in an organized process. We are able to seek names to programs we have (internal and external) as well as come up with the next greatest amenity to offer to our residents. We have also been successful in organizing all of the pilots we are currently running and we have created a better process around submission and tracking. The benefits are really great the most notable one being that our associates feel like they are being heard and have some buy in. It makes people feel a little more vested and part of the organization. "Brightidea Review from Financial Services Professional"
My favorite thing about Brightidea is the flexibility of the platform. There are so many customization capabilities it can be a little overwhelming but it allows us the ability to automate many of our manual processes. Also, the team is great to work with, from their sales, support, professional services and our personal customer success manager. I feel liketThey really listen to our recommendations and concerns. The reporting and dashboard are a little lacking. There isn't really a "presentation layer' which allows us to organize and present the information about an idea to our executives. We have to export the information and create our own PowerPoint slides. Also the 'business impact' section isn't represented in the dashboard correctly. We must export the data and create Tableau visualizations from the data. Everyone at Brightidea has been great to work with. I highly recommend the solution. I feel like they really listen to our needs and want to improve the system to work better for us. A couple of our recommendation have already been implemented with their weekly system upgrades/fixes. Although there are still some things we would like to see improved, they were far and away the best solution from all of the vendors we looked. We are automating (as much as possible) a process which is very manual and time consuming using the rules engine to kick off tasks and communications. We are still in the 'build' phase so we haven't fully realized any benefits yet. We run themed and open challenges (over 100 to date) on a many topics - leveraging new technology, Supporting Hackathon events, improving our customer experience, pitch days/ dragons' den to name but a few. The social features that Brightidea provide are fully utilised by our employees and the business impact that has been banked by the business as a result runs into millions (GBP) each year. Multiple types of innovation tools all in one place. Powerful backend that can hand large bulk amounts of ideas. Very open to ideas to improve the platform outside of contracting them specifically for your needs. It does take quite a while to get changes via the IdeaSpace platform. It would be nice if there were more information about actual prioritization or where your idea stands. Most of the time it ends up In Product Backlog for a fairly indefinite amount of time. A lot of other similar tools can do similar things. A lot of them are great at coming up with a pretty looking GUI/front end. Where they fall apart for us is that outside of small, targeted challenges that collect a few dozen to maybe a little more than 100 ideas at once. They don't have the engine under the hood to collect, organize and manage THOUSANDS of ideas, nor be able to keep them historically as you continue to add to that number. Brightidea does the front end well but it also does the back end work well. We have an always open challenge that we use for all team members in the company. Previously the tool was built in-house and we had a heck of a time trying to organize and keep up with reviews to determine a pathway for the ideas that were posted. While it took several process changes internally, Brightidea helped make this organization far easier. It also has allowed us to open up more possibilities outside of that collection box like using it to run our own Pitch Day and Hackathon events. "A great place to gather and monitor ideas"
I really like how easy it is to get going. Submitting an idea is easy and the customization makes it so the data you get from people submitting ideas exactly what you need. The idea of Challenges really helps get things going. It makes it so it's not just an endless hole of general ideas, but it allows you to give ideas about different topics you may not have thought of without a specific challenge about it. And it gives a good timeline for those ideas. The mobile app struggles to log me in and stay logged in. I can get past the login screen but it never actually loads anything, just shows the brightidea logo. Notifications on the site can be a pain because even though I click the globe to view them the little red bubble doesn't go away until I click on it, mark it as read, or delete it from the notifications list. I can see why some people might like it, but having an option to change that would be nice. As a user having our in-house team show us how to do it and then host events that encourage us to submit ideas outside of solo submission was helpful in getting people on board. It's not just about getting ideas, it's about feedback. At first, people will say "it's not for me because I don't have ideas." so you should let them know it's not just to submit ideas but to give feedback on what others submit. Idea submissions from those not regularly involved in the innovation process. "Awesome software with room to grow"
How intuitive the features are to use. It took very little time for me to figure out how to use. The features themselves are also useful. I love the budgeting tool, tasks and milestones especially. Notification settings are limited - I get an absurd number of emails from the different workspaces I’m in. I also wish there were dependency options for tasks. Like once X happens then Y is assigned. Great software! It’s new so they’re still fixing things but overall a great product. They have been quick to answer questions/concerns and I'm confident they're working to implement positive changes. "Top Notch Ideation Platform (And then some ...)"
Backend tools for managing ideas is by far one of the best in the industry. No other company (so far) has made it easy for Customers to be able to manage their pipeline of ideas generated. Due to the idea of making it easy for Customers to create campaigns via Wizards, at times Customizations can be cumbersome. Advanced Customizations require the help from Professional Services. Easy to use platform for ideation, crowd-sourcing and talent management. Company continues to innovate and add features including the ability to do Hackathons among others. We've applied the concept of "Ideation" to solve multiple types of problems including process improvement, simple idea generation, business challenges, "the next big thing", a place for employees to collaborate and a "marketplace" concept. There is no shortage of ways to leverage Brightidea's platform. "Great Platform for Engaging Employees in Innovation"
I love having the ability to not only gather ideas from employees but also track the ideas as the ideas are implemented. The analytics generated from the platform are also very useful in determining where we need to focus our efforts to engage more employees. I'm still learning how to use all the features of the platform. I would love to have more options for customizing the home page without too much coding. We're using the platform to solve problems related to our school district. Some of the topics are teacher recruitment and retention and customizing professional learning experiences for educators. We're just beginning to utilize the platform but I've already seen more engagement from employees. We've also moved several ideas into production. "Great product from a grwat company "
Mostly idea gathering and rating with multiple challenges for various parts of our company. We mainly run hacathons and mini hacathons. The new app for them is great! Browser based app is a plus. Fairly clean and easy to navigate. Not able to browse by date submitted. Comment function disappears after certain stages. Make sure your team understands its needs before purchasing. The new Team Workspaces are good, but need improvement and more functionality. Ability to have dependent tasks, comment/files under tasks, and to adjust notifications are basic abilities in any project/workspace/task app, and SmartLab doesn't have them yet. We also can't include a link to a file, instead of uploading files (or at least link to other cloud storage solutions, like Dropbox and OneDrive). It's quite a gap for us, but hoping those features arrive soon so we don't have to use another app to fill the need. Central hub for ideation; we allow employees and community members to submit ideas. "Best Platform in the market for Idea Management"
My favorite parts are the user friendly design, easy to use feature and great support by Brightidea system. If you know how to use Facebook, you will love Brightidea platform. All features are WYSIWYG (What you see on the screen is what you will get on output). Support team from Brightidea is always prompt with high quality delivery. So far, everything is great. If the platform can evolve AI technology for the next generation release, that will be great! If you are looking for a platform for any type of ideation management system, Brightidea is the right and best one in the market. We were facing challenges to have a nice platform to collect and manage the review process for ideas. We were looking for a system with the capability of easy collecting idea, automating the review process, and easy to setup and maintain the system (code less) while with flexibility for customization. Also, we were looking for a platform with scalable and repeatable versatility. Brightidea platform is right there for us with mobile APP free for us which is another factor that why we chose it. It's improving the engagement of idea collection, visibility of reviewing process, collaboration of idea management and innovation roadmap business benefits. I do recommend this to all my colleagues. My account manager from Brightidea is always supportive for any of my business requests. "A trusted partner who helps you navigate the fog of innovation. " We had to setup a brand new innovation challenge in less than 1 hr and we pulled it off to showcase to our Senior Management. Very impressive! The team is always there! - it's like you have an in-house team without the cost. Their Relationship Mgr / Account Manager is very committed and so is their platform expert. The platform is flexible and they think of a lot of use cases. If you are looking for any means of engagement, BrightIdea has got an app for it. BrightIdea is constantly innovating their platform capabilities to keep it current and satisfying your innovation needs. None that is a showstopper. Perhaps the platform can be more customizable by the end user. But I understand that they cannot make everyone happy at the same time. These elements are things that I am willing to wait. Use BrightIdea since the team shows true passion and commitment for your success. They go the extra mile! "Beautiful modern sites with LOTS of customizable options"
my campaigns are quick to deploy and users really like the quality of the site's look and feel right out of the box. I like all the options that are available in the UI for setup as well. I find each campaign sponsor or point person really have a lot of requirements for how they want the campaign to function, and it is fun to be able to say "yes, Brightidea can do that". legacy terms like webstorm persist in the system. these should really be cleaned up. The UI for system admins is fine, could be better. The taxonomy of the site, things like email controls and configuration options (global and campaign level) seem to be in lots of different links, which makes them difficult to find and navigation is rather clunky and not too intuitive. I wish there was a way to interact with other customers. Specifically for ideas on campaigns, success stories, promotion material, etc. An online moderated community of admins would be splendid for moral support and idea generation and give an opportunity to feel more connected to the Brightidea brand. training materials are rather light, so you must be willing to explore the application on your own. For instance, there are no videos or selfpaced trainings. There is a heavy reliance on personal interaction with sales/account team, so the quality and availability of sales team can greatly impact onboarding speed and ease. finding new product opportunities globally, quickly, and gaining alignment with leadership for implementation. "Powerful & User-Friendly Collaboration Technology"
The flexibility that BrightIdea has provided has given us the ability to leverage the tool in many different areas across our enterprise. There is no one-size fits all solution, and BrightIdea allows us to be innovative in how we use the tool. Clarity between Webstorm and Enterprise is not always great, and occasionally multiple terms are used for one thing (webstorm vs pipeline -- what is the difference?). BrightIdea is a straightforward tool to rollout in a simple manner -- what is not as straightforward is ensuring internal buy-in. This is stressed by the BrightIdea professional services team -- internal executive sponsorship is a must, as well as top-down interaction within the tool. Make sure that as you implement and consider BrightIdea, you know who within your organization will be an advocate for the program. We have enabled new ways of solving problems by using BrightIdea, as well as allowing a consistent method of providing feedback using the tool. Apps are the most powerful side of Brightidea. Do you have a problem you can't decide how to fix or even name? There is an app for it! There are some minor bugs and it's taking some time to fix them. Make sure that you stay in touch with your at Brightidea contact. Having a good personal communication can speed up things and helps you know every aspect of the system, letting take full advantage of the product. They are offering more than you see on the first sight. Cost cutting, process optimization and product development. Other than seven figure financial benefits, people are more excited about their ideas because they see the outcome themselves. "Transforming the way we work "
Ease of use- The platform is extremely easy to use and navigate. It's great that you can create a new initiative page within minutes. I think a lot of newer product release items like team workspace, business impact modeling, etc. are going to be a great added value for our team + users in the near future. Love that these features were added! Since the entire platform is highly configurable, I don't necessarily agree that all the different apps are needed. I wish the formatting/site layout differed more and better represented the types of use cases intended for each app out of the box. Example- the Discuss app and Optimize app layout looks almost the same. It would be great if the Discuss app looked more like a true continuous discuss forum instead of having to submit each thought as if you are submitting an idea in the Optimize app. Benefits- employees have recognized that they now have an open space to share ideas, collaborate with each other, and meet new people outside their department. This platform is helping our organization build the foundation for a cultural shift at Ralph Lauren. Over the past year since we've launched the platform, other departments are exploring different ways of using the platform other than idea sharing (i.e. project submission, evaluation + tracking). "System review and typed discussion"
Overall, the platform is very flexible and gives customers the ability to change and modify challenges to meet the needs of challenge and idea owners alike. Very intuitive and gives many different capabilities to add graphics to increase marketability. BLUE COLLAR: The ability to log-in seems to be a big sticking point for customers. If the system isn't able to accept log-in methods outside of emails, it limits the potential growth. In addition - having easy ways to engage an hourly employee - someone who works in manufacturing and may not have easy access to a computer - is a need. Maybe BI offers some sort of hardware to come along with the software? WHITE COLLAR: Need an easier way to engage EXTERNAL users, without having to have a separate contract. Great software and apps. I don't know that I really like the "major releases", may be even more intimate if releases happened as needed - and customers were contacted directly to assist. My #1 recommendation for Brightidea is to LEAD the innovation space. This means a lot, I know, but I see your competitors making changes that meet additional needs outside of the internal crowd that BI seems to be missing. Overall - we are using Brightidea to solve challenges related to our product, our processes, and many areas that reach our customers. The biggest opportunity we have is to allow our employees and our crowd easy access to the system - while also managing and protecting our IP. Employees are the best source of knowledge regarding how work could be improved both for processes and customer experiences. Just ask them! Keep employees engaged, let them be heard. I can't think of anything right now. I've been the administrator for 3 of the 4 years my company has partnered with BrightIdea and they are very responsive to questions and eager for feedback and ideas for enhancements. Continuous improvement! Every person I've met at Brightidea has been top notch! They're a passionate and enthusiastic group and a joy to work with. In addition to crowdsourcing ideas, we've also used the platform to connect people with "talent sharing" opportunities. This creates avenues that haven't existed previously. "Neat product to expore innovation from a wide group of people"
It is really easy to post ideas, review others, and track which ideas are doing the best. I like that there are various ways to sort ideas. Not sure if this is just the way that we use the product or if it is a product issue, but when we request to join a team it doesn't always see to work. This has been a great tool for us to gather ideas, get feedback from others, and to form collaborative groups to explore innovative solutions to our business problems or opportunities. It allows us to collect innovative thoughts and ideas to improve our current way of doing business, or to create new lines of business to fulfill our mission. Working with Rod has always been easy and he is always quick to help out and offer suggestions. We have engaged the design team many times as well and had a great experience. Tech support has always been very responsive and helpful with their solutions. Costs can quickly add up for certain items and the design work can be pricey. It would be nice if the customer could edit more of the website code. We understand that this isnt available though because someone could easily destroy their site if they didnt know what they were doing. We have also had issues with Google translate not being the best for challenges we need to run in different languages. We are running challenges for new products and solutions as well as creating ways to gather information for some of our business units. We also have an external site to run public challenges and collect general ideas for the company. "A simple tool to crowd source innovation"
How easy it makes it to crowdsource innovative ideas from an entire organization / network in a centralized platform. UX design and overall 'feel' of the platform feels a bit dated but still accomplishes the job. Not sure if other tools are on the market that allow you to do something similar or not. Bright Ideas provides a turnkey solution to crowdsource innovations - and is especially beneficial if you have a lot of remote employees. Give it a try or at least view a demo! Group brainstorming with remote employees.. Crowdsourcing best ideas and allowing individuals to vote on ideas. It's allowed us to create buy-in from multiple parties within the org. BrightIdea is always innovating and adding new features to make the product better and easier to use, but what I like best is the support we receive from BrightIdea. Many vendors are hard to reach after a contract is signed with them, but BrightIdea is the exact opposite. We are constantly working with them and they provide us with amazing support on best practices for running our WebStorms. The business problem we are trying to solve is how best to gather the best ideas from our workforce and leverage those ideas internally and with our clients. "I've been using Bright Idea pretty regularly for the past 1.5 years." I love the ability to capture all of your organizations ideas in one central location, and the ability to comment and vote on each idea. More recently, I love that you're able to use it as a project management tool with the workspace functionality. There are some pains that my organization has experienced with this platform. Having to repeatedly log in on the mobile version (wish it would remember me) slows things down and currently, getting a notification email each time a task is updated or added to a specific project's workspace really affects the user experience negatively. I'd rather get a notification in Bright Idea for that vs. as an email. Brightidea is a one-of-a-kind software and is a must for any innovation team, especially. Plus, their support team is incredible! Brightidea is a tool that our innovation team decided our organization should invest in so that we could capture our organization's fundraising ideas, and have slowly expanded to adding several of our outside partners to contribute ideas to Brightidea. The business problem we're solving is organization, organization wide buy-in and input, and more funds raised for our non-profit. We've realized that Brightidea is the cornerstone of our organization and without it we won't be able to create new ideas to raise more funds. "Easy yet not so much." Submitting ideas is easy and asks detailed questions. The home interface, as easy as it is to navigate, can still be confusing. There seem to be several "Menu's". One at the top for my general profile, one in the middle for how it works and challenges, the there is more info below it. It becomes too much information. We are trying to come up with new ideas to increase fundraising, or improve current fundraising programs/initiatives. It has been a great platform to read in detail all the ideas other employees have. At the same time, they seem to all be divided and spread out making it hard to see a "list". "Format works well, sometimes experience glitches"
We utilize Brightidea as a way to involve all members of our organization in the innovation process. We use it to source new ideas and to host the beginning stages of projects for our semiannual Hackathon, where employees can form work teams around a wide range of topics, explore ideas, and dedicate work hours to solving problems and innovating in areas that interest them - regardless of their job title or usual work department. "Great tool for helping generate ideas"
The support we get from the Brightidea team is really good. Any time we have a question or issue, they respond quickly. The tool setup is still a little complicated and some settings are not obvious where they should be, but overall between the Brightidea support portal and the team we are able to get things done quickly. We help other areas get set up to solve their business problems. Some are as simple as coming up with a name for an initiative, others generate ideas for improving processes in the company. While I do like the product, I have to say our new account manager, Mackenzie, has actually made this experience for the team and added great value. On the product end, I enjoy the ease with which we can setup an app for a challenge or discussion board and the flexibility of the pipeline. The email notifications are not as robust as we would like. If it were possible to insert images into the emails we could manage much more of our communications through the platform. Also, there is no way to do classic surveys or polls- this should be included as an app! Ensure you have senior leadership support and consider the position of the program within the organization. "Excellent ideation platform with superb customer service and tech support"
An innovation program is only as good as the business impact it produces. 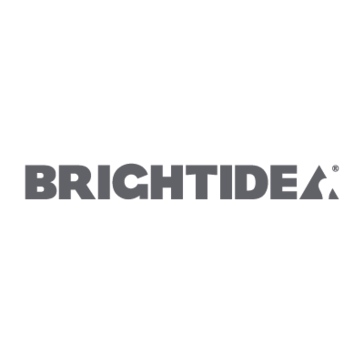 Brightidea allows you to manage your idea portfolio end-to-end and track your results. Some systems focus too much on gathering ideas but are skimpy on management, but Brightidea does both beautifully. I also want to praise the Brightidea team. Everyone has been top-notch, from front-line support to design to account managers to senior leaders. I get responses to my questions almost before I send them! Personally, I would like to see a few more options for reporting and dashboards. I'd also like to see a reorganization of the online knowledge base. I understand that they have to keep information out there for users who have many different versions of the software, but it could be categorized better so you can find an answer based on your company's version more quickly. Don't be fooled by a snazzy front end or a product that promises you the moon and the stars...for a steep fee. Brightidea is a solid, proven platform that has excellent innovation management capabilities. Add in the excellent customer support and service, and you can't go wrong. I can't go into specifics about the problems, but we run the gamut from process improvements to complex enterprise issues. Benefits are in the tens of millions of dollars. "Great interface and very enjoyable interaction with others"
I really enjoyed looking at others' submissions and being able to vote, comment, and ask questions on each submission. It was a bit difficult to figure out how to create a topic for submissions. Highly recommend! Great interaction with other users and allows great resourcing with other collaborators in other areas of the country and other levels of skill sets. Lots of eyes and experiences to improve processes. I really enjoy the ability to use pictures of issues and resolutions. We are solving efficiency areas of productivity and customer experience. We have identified several areas to better serve our employees and our customers. I like that it is a clean collection point for ideas. As a large organization that is new to having an innovation team, this has really helped us build our idea pipeline and create a path for our team. I really dislike that the workspace (which is a super helpful feature) sends emails to all people following the idea, and there is no setting to turn off those notifications. We have people who want to access that space, but not get a ton of emails all the time. THis feature really needs to be changed. Though I wish there were more customizable features, it's still an incredible tool for my team. This software provides the lliteral lifeblood of our innovation program. The ability to build a community and mobilize that community to innovate is great, but to do it this easily is unheard of. Do this for your future self. Our company hasn’t launched anything new in 7 years. In our first year on the platform we’ve brought two viable new concepts to life! "Has been effective in collecting ideas from the crowd and managing the pipeline of ideas ." Nothing really stands out as an item that I dislike. If I had to say something it's the admin and reporting menus are a little confusing and clunky. We've done a poor job utilizing the powerful capabilities BI offers. Presently we're using it managing innovation initiatives such as new customer experience onboarding and product development. I like the customization it allows; It is easy to use and navigate. We use a single sign-on through our intranet site and you can't back out seamlessly--you have to back to the original intranet site to get in. I have also never been able to get it to work on my mobile device. test the app/ mobile features. We use it for brainstorming, cross-functional collaboration, and innovation. I love the ease of adding ideas! The program makes it really easy to add comments, ideas, and I like how it even allows for external stakeholders to get involved. Sometimes the follow up can be confusing. When an idea is move to a different category and I try to see the process, it says that I'm restricted. This may be an issue on my company's side, though. Our company is always trying to be more innovative and test out new ideas so that we can have a bigger impact. This has shown me that I work with some pretty smart and innovative colleagues. It was a great idea to create the Customer Success team. The technical team does not take phone calls. Definitely purchase training/consulting hours so that you know all of the capabilities of the software. Broken customer experiences/processes. It gives a voice to the employees after identifying an opportunity during customer interactions. Brightidea is such a great open innovation tool. It allows my company to create and think innovatively. The apps and the site itself is very professional looking but easy to set up. I dislike some of the backend features but they have made huge advancements in this previous Fall (2017) update. The biggest business benefit is allowing our entire network to contribute to new ideas and innovation. easy to use, fast to configure. Intuitive. would like to see more flexibility around form creation (eg embedded tables). management of the entire business improvement idea lifecycle. This tool has allowed us to capture and implement hundreds of systems and process improvements with the idea submitters having full visibility of the lifecycle. "Review of Brigght Idea Innovation Platform"
Brightideas is easy to use and navigate and easy to engage others with. Nothing. As an administrator, I feel it has a few idiosyncrasies' but nothing too out of the ordinary. The challenge home pages have enabled us to maintain a single source of truth regarding a particular project, efficiently capture feedback while testing and communicate in a transparent manner with testers and stakeholders. The reporting capabilities are a bit basic for needs. Also, I don't know how to link apps and have a single view of our innovation pipeline. We are leveraging Bright Idea as a single source of truth for our innovation work, as well as to scale our team and provide communication and transparency. "A great tool for a small innovation team"
Brightidea is easy for me to use, even though I am not a developer. I can set up challenges quickly and they look amazing. Our Employees love the UX and I love the reporting. I truly can't think of anything. Everytime I have a need there seems to be an answer! "Brightidea enables our corporate innovation program"
I really enjoy working with the Brightidea software; it's easy to use and to train others to use. Our account manager partners with us on our goals to ensure we meet or exceed them. The technical team is great too with quick response times and on-time delivery of enhancement requests. Like many tools, sometimes there are glitches in the tool. However, when I raised a ticket in the past, their support team looked into the issue almost immediately. . The idea management section allows a private space to collect and manage feedback from your evaluators. This is extremely helpful for those administering the process... excels are dreadful to try and collect a score from an evaluator via email, let the tool do the work for you. Solution: Our team builds innovation capabilities by training our associates on innovation and what is involved, this enables everyone to use common terminology. We enable teams to innovate by providing a corporate innovation platform (using Brightidea software) to collect any of their ideas. We work with organizations to identify key problems they need to solve and then we will facilitate an innovation event to crowd source the ideas to find the proper solution. "Solid platform to crowsdource ideas within the organization"
My favorite feature in Brightidea is the ability to communicate, in real time, with our entire global staff here at Oxy. Whether it is a member from our Oman business unit, or someone local here in Houston, Brightidea has allowed us to collaborate and work in a more creative and innovative way. The system can be seem sluggish at times while pages load. We are utilizing Brightidea to help Oxy find new and creative solutions to our business unit's most pressing problems. "Brightidea review for Just Fix It"
The tool has a lot of great functionality that can be used for several different purposes and tailored to meet our needs. We don't use the site as it is intended to be used, but we have customized it in a way to meet our needs. It would be helpful if there was a customer support line that we could call into rather than emailing Brightidea support. Sometimes it would be easier to talk through any technical issues rather than discussing via email. We are using Brightidea to capture employee suggestions on how to enhance the customer experience. It's a good tool to capture and track the suggestions that we receive. "Easy to use, awesome tracking." I really like the visual "steps" in the back end to see where a project is along it's journey from idea to project. The backend can be a big confusing at first, just takes some time to get used to. "Strong product with great support"
The flexibility of the platform to be manipulated into a format that fits our specific use cases and the Bright Idea team's support through our implementation and continued execution. The Mobile App leaves some to be desired. We are solving the ability to innovate across a massive organization in an agile way. We have engaged nearly 20,000 employees in innovation activities over the past year, something we were never able to do before. "Engaging employees on the corporate vision"
We like the easy way we can use BI to ask our employees to react on specific strategic questions. "Smooth on boarding - good experience so far"
Still early in the program launch but so far the setup and inital kick off has been smooth. The BI team has been responsive and very supportive of our needs. Anticipating some very positive results from this program. The charge model can quickly escalate due to needing stakeholders to have admin access. Still too early in the program to quantify results. Ease of use. Self-intuitive design. It does not take a lot of effort to create and launch a new challenge. less than 1 hour setup time from start to finish. not much to complain. There are too many apps, you can get overwhelmed by it. Be sure to review each and know the difference. The tool is great. the People at BrightIdea are very passionate and are eager to make you succeed. Solving engineering problems. We are seeing positive engagement because of BrightIdea. * We monitor all Brightidea reviews to prevent fraudulent reviews and keep review quality high. We do not post reviews by company employees or direct competitors. Validated reviews require the user to submit a screenshot of the product containing their user ID, in order to verify a user is an actual user of the product.